Cannas are sometimes referred to as canna lilies, but they aren't really lilies at all. They have striking, dark green foliage with white stripes and large flowers in a variety of colors including red, orange and pink. A tropical flower, they do well in containers and in mild climates. The flowers attract hummingbirds. Pruning your cannas encourages them to bloom continually throughout summer. Fall pruning prepares them for winter. Cut off each flower after it completes blooming, but before it goes to seed. Remove it beneath the flower head and above any additional buds or healthy blooms. Cut the entire flower stalk off at the base once all of the buds have opened and completed blooming. New stalks will grow and produce blooms once the old ones are removed. Inspect the plant every one or two weeks during the growing season and remove any dead or damaged leaves. Check for seed pods from faded blooms and remove them. Allow the foliage to die back naturally in autumn. Cut any remaining stalks to the ground and cut the yellowed foliage back to 2 inches high. Plant cannas to a depth two to three times the height of the bulb. Measure distance from the bottom of the bulb and cover with loose soil. 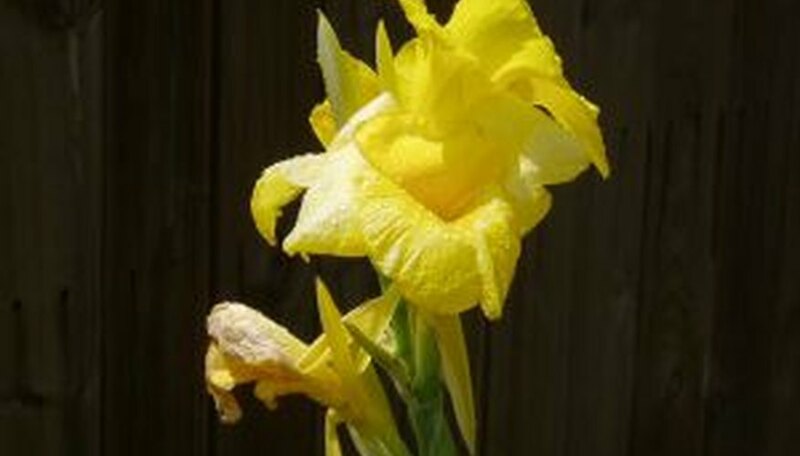 Cannas start to bloom in early summer and will continue to bloom until the first frost if old blossoms are removed so they do not produce seeds. In any applicable climate zone, wait until frost kills the foliage of the cannas and then cut it off to just above the tops of the bulbs. Discard the dead foliage. In climate zones 9 and 10, cover the cannas completely with a heavy layer of bark mulch, straw or hay. Clean them of excess soil by brushing off the dirt gently with your fingertips, a paper towel or a soft clean cloth. Don't wash the soil off them. Take the bulbs inside to a place where the temperature won’t drop below 40 degrees Fahrenheit for the entire winter. Separate the bulbs from one another with several inches between them and let them dry out for a few days. Put the bulbs in a cool location for the winter. A heated garage or garden shed would be ideal, but what's most critical is that the temperature in the space where they're stored should stay between 40 and 50 degrees Fahrenheit. Ensure that your Yellow Cannas is placed in a sunny location in your garden. Fill a watering can with 1 1/2 cups room-temperature water. Shower the Yellow Cannas with water every three days to ensure soil is properly moist. Remove any dead or dried leaves on a weekly basis from your Yellow Cannas plant. You may dispose of dead leaves in a trash or compost bin. Place a trash bag over your Yellow Cannas when the temperature reaches 40 degrees. It is very important that you protect your Yellow Cannas from frost on cold winter nights. Add one cup of mulch to the area around your Yellow Cannas every two months to protect the plant by keeping nutrients and moisture in the soil. Select a location for planting canna tubers that offers full sunlight and moist soil. Plan enough room to space the cannas 1 foot apart for dwarf varieties and 2 feet for standard. Prepare the planting area when the soil is warm and the last chance of frost has passed. Cultivate the soil to a depth of at least 1 foot. Blend 2 to 4 inches of compost into the area. Dig 4 to 6 inch holes. Place the canna tuber (rhizome) in the holes horizontally. Cover with soil and pat down tightly. Saturate the newly planted cannas with water. Soak the cannas with water weekly during the growing season, as well as anytime it rains less than 1 inch. Cover the area around the canna tubers with 2 to 4 inches of mulch. This keeps weeds from growing and maintains moisture in the soil. Apply a fertilizer with a rating of 5-10-10 or 5-10-5 (as directed) when the cannas appear. Spread the fertilizer around, but not directly on the shoots and drench with water to force it to the soil. Reapply fertilizer monthly during growing season.